Parenting is the most challenging job any of us will ever do. It’s the most important one, too. Quite literally, we’re raising Connecticut’s future. We’ve always worked together as communities to help our children grow healthy, safe and eager to learn. Sometimes, though, our leaders in Hartford and Washington forget this. Right now they want our votes, so it’s a good time to remind them. We need strong leaders who will take charge of Connecticut’s early care and education, schools and health care initiatives. It’s time to spend dollars for kids and families where it makes sense and really helps. We must make sure that Connecticut’s early care and education, school, and health opportunities are easy to access, parent-friendly and expand our choices. 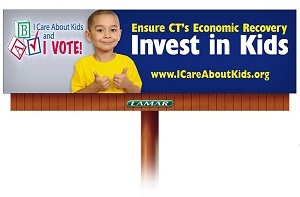 Sign up now to cast your vote for our kids, to get the latest campaign updates and to see how you can spread the word. We can’t get you a billboard (though you might see them on I-84 or I-95), but you can request a lawn sign!